(Nanowerk News) Stroke victims could have more time to seek treatment that could reduce harmful effects on the brain, thanks to tiny blobs of gelatin that could deliver the medication to the brain noninvasively. University of Illinois researchers and colleagues in South Korea, led by U. of I. electrical and computer engineering senior research scientist Hyungsoo Choi and professor Kyekyoon “Kevin” Kim, published details about the gelatin nanoparticles in the journal Drug Delivery and Translational Research ("Gelatin nanoparticles enhance the neuroprotective effects of intranasally administered osteopontin in rat ischemic stroke model"). 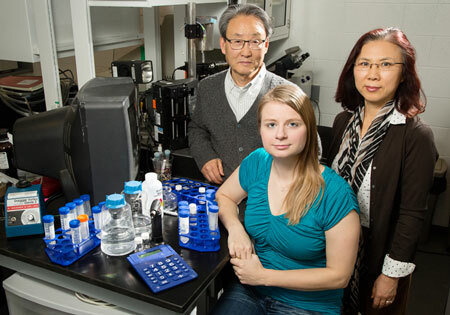 Illinois professor Kyekyoon “Kevin” Kim, graduate student Elizabeth Joachim and research scientist Hyungsoo Choi developed tiny gelatin nanoparticles that can carry medication to the brain, which could lead to longer treatment windows for stroke patients. The researchers found that gelatin nanoparticles could be laced with medications for delivery to the brain, and that they could extend the treatment window for when a drug could be effective. Gelatin is biocompatible, biodegradable, and classified as “Generally Recognized as Safe” by the Food and Drug Administration. Once administered, the gelatin nanoparticles target damaged brain tissue thanks to an abundance of gelatin-munching enzymes produced in injured regions. “It is crucial to treat ischemic strokes within three hours to improve the chances of recovery. However, a significant number of stroke victims don’t get to the hospital in time for the treatment,” Kim said.